The Freedom From Religion Foundation, a state/church watchdog, is formally objecting to an extremely rare national honor being accorded to the late Billy Graham. According to a press release from the Speaker's office, "On Wednesday, Feb. 28, the late Rev. 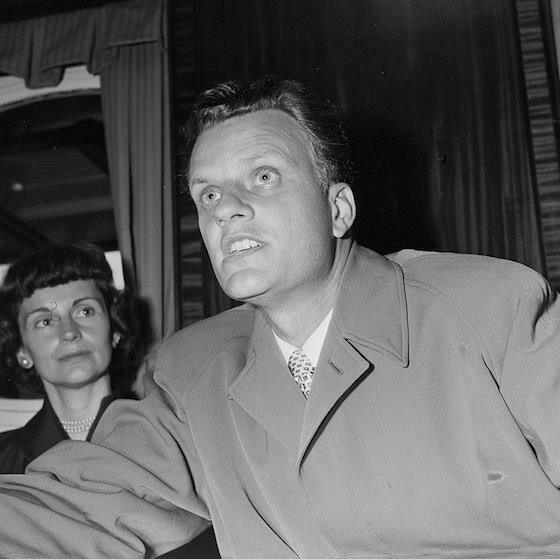 Billy Graham will be brought to the U.S. Capitol, where he will lie in honor in the Rotunda until Thursday, March 1." Only 31 persons have lain in state in the U.S. Capitol since it was completed in 1824, 11 of them presidents and all the others known for their direct and incontrovertible service to the nation. In Rosa Parks' case, for instance, it was for her iconic role in the civil rights movement. Graham, on the other hand, worked to narrow civil rights. "Your joint letter to Franklin Graham, dated Feb. 22, indicates this unique civic honor is being accorded to Graham for his 'long and distinguished service to the nation,'" FFRF Co-Presidents Dan Barker and Annie Laurie Gaylor write to House Speaker Paul Ryan and Senate Majority Leader Mitch McConnell. "But the fact is that Graham lived his life in service to his evangelical Christian religion, and the bible that he believed was an infallible reference manual. He placed the bible far above the Constitution." Graham's career was devoted to revivals, Christian conversions, hellfire preaching and the insertion of his brand of religion into what is supposed to be a secular government governed by a godless Constitution barring establishment of religion or governmental preference for religion, FFRF points out. One of Graham's dubious accomplishments was to successfully lobby Congress to pass a law declaring an annual National Day of Prayer. This law enacted at Graham's behest, which FFRF has previously challenged, has entangled religion and government, spawned countless inappropriate prayer breakfasts, prayerful governmental events and prayer resolutions at all levels of government. In doing so, it has sent for generations a message that evangelical Christians are "insiders" and non-Christians and the nonreligious are "outsiders." FFRF also highlights how irresponsible it is for the U.S. Congress to venerate and honor a noted anti-Semite. The secret taping system that recorded President Nixon's conversations and led to his Watergate downfall captured Graham's anti-Semitic musings with Nixon. "A lot of the Jews are great friends of mine, they swarm around me and are friendly to me because they know that I'm friendly with Israel," Graham told Nixon. "But they don't know how I really feel about what they are doing to this country." Graham was on the wrong side of the leading issues of his time. The day after Martin Luther King Jr. wrote his letter from the Birmingham Jail — a letter addressed to white religious leaders like Graham who were doing little else other than "mouth pious irrelevancies and sanctimonious trivialities" — Graham mouthed a few more, arguing that King should "put the brakes on a little bit." Graham seemingly never met a U.S. war of aggression he didn't favor or encourage the occupants of the Oval Office to wage. As columnist and former priest James Carroll observes: "Billy Graham was the high priest of the American crusade, which is why U.S. presidents uniformly sought his blessing." Graham vociferously opposed gay rights and marriage equality, saying "we traffic in homosexuality at the peril of our spiritual welfare." The Billy Graham Evangelical Association once said that Vladimir Putin was "more right" on LGBTQ rights than then-President Obama. Graham, in his 90s, wrote a full-page ad appearing in several North Carolina newspapers "to urge my fellow North Carolinians to vote FOR the marriage amendment" in May 2012, which passed, banning gay marriage until later nullified. He belonged to a denomination that refused to ordain women. The "Billy Graham" rule directing a man to not be alone with a woman other than his wife continues to influence evangelicals, including Vice President Mike Pence, isolating career women in the process. Graham stood against much of what makes this country noble, FFRF asserts. He is not worthy of a spot in the U.S. Capitol. "The wisest path to social harmony and unity is for Congress to leave religion to adherents," FFRF notes, and to reserve the posthumous rotunda tribute for civic, secular achievers. The Freedom From Religion Foundation is a nationwide nonprofit educational association that on behalf of its 32,000 members nationwide works to uphold the constitutional principle of separation of church and state, and to educate the public about nontheism.